Okay, check that. I start a lot of books. Most of them are history or historical mystery, or some other subset of the mystery genre (classic hard-boiled/noir, contemporary noir, police procedural, and so on), and I don't finish nearly as many of them as I start. In today's post I'd like to give a thumbnail sketch of one of the books that I did actually finish. Because, hey, it really was that good. Yes, *that* Max Byrd, an Edgar award-winning author who has written a terrific new novel in what I hope might be a new series. It's called The Paris Deadline. I cannot urge strongly enough those who love historical mystery for both the history and the mystery to pick up this book and give it a try. I stumbled across Byrd and his work quite by accident. Late last year I read his review of Alan Furst's latest in the The New York Times and liked the writing in the review so much I took a flyer on Byrd's latest, The Paris Deadline. I was far from disappointed. The book is set in1927 Paris, its protagonist is Toby Keats, an expatriate American who works the rewrite desk for the International Herald Tribune. Keats is a veteran of the Great War: a sapper assigned to Sir John Norton-Griffiths' famed international "sapper" unit, and spent the war working to keep the Germans from tunneling under the Allied lines (sinking mines, then blowing them up, collapsing trench networks, etc.). Scarred by his experiences during a particularly traumatic cave-in, Keats avoids tight spaces- won't even use the Metro-and quickly informs the reader he is the "only American in Paris at the time who did not know Ernest Hemingway." He does however know and work with both (future food writer) Waverley Root and a particularly ambitious young would-be war correspondent named William L. Shirer. We're no more than a few chapters into the book than Keats finds himself caught up in the search for an antique automated duck (designed by the famous 18th century inventor Jacques de Vaucanson) whose inner workings might just hold the key to designing guidance systems for a newfangled invention called a "missile." Not surprisingly, the duck goes missing, and equally not surprisingly, a bunch of Germans are dead set on getting their hands on it. Competing with them for this prize are a haughty Wall Street banker living and working in Paris, a beautiful American girl sent by none other than superinventor Thomas Edison to purchase said duck and take it back to America so Edison can study and replicate it. People get dead. People get beat up. Keats gets thrown together with the aforementioned beautiful American girl a number of times, all in the quest for this duck. 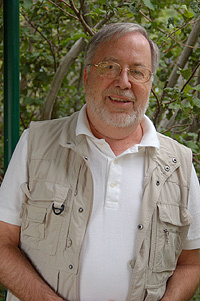 And Byrd, who has several historical novels featuring former American presidents to his credit, makes it all come together and sing like, well, like a wind-up nightingale! Byrd evokes 1920's Paris so successfully that at times I felt like I was reading an unpublished chapter of Hemingway's A MOVEABLE FEAST (and coming from me, that is praise). The story is engaging, the characters charming. The mystery at the heart of the book compelling (after all, it's about a two century old toy duck, of all things!). 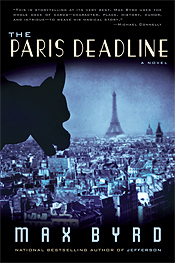 Little wonder Kirkus called The Paris Deadline one of the ten best historical mysteries of 2012. I give it my highest recommendation, and just hope there are more where this one came from! Check out Byrd's early work. His P.I. novels are very good. One MORE book to add to my reading list! Thank you!